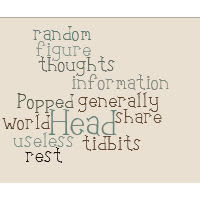 www.tagxedo.com is home to one of the coolest tag cloud generators I have seen yet. The site allows you to create word clouds by typing in a list of words, providing a URL, or by uploading a text file with a list of items. It ignores common words or very small words (note the lack of "My" in the cloud above). The other issue is that it lacks support for numbers. That may not sound like a big deal, but you won't be making clouds for graduation, reunions, child birthdays, anniversaries, etc any time soon. The site's owner and creator says that numbers will be available in a future iteration of the site. If someone happens to know some "trick" to display numbers, feel free to share and I'll pass it along. I figure it's a feature that many folks would like to have. I've read other reviews of the site that made suggestions like frames, etc. I guess I don't see that as a big deal. I don't really care if my cloud has a frame around it. Then again, I am generally simple-minded, so there ya go. I like the fact that you can actually choose shapes for your cloud, and you can even upload your own picture and make a shape out of it! Sweet! I'm looking forward to the growth and development of the site! Check it out for sure next time you want to play with your words. Hi, this is Hardy Leung, creator of Tagxedo. I just came across your blog post on Tagxedo. I'm happy to let you know that Tagxedo now supports fine control over numbers, punctuations, stemming, stop words. This update has just been released! Please check it out. Hope you and others like the new features. Tagxedo - Talk about service! What is in my short story collection, anyway? Top Nine Idol-ers perform. It's Beatles Week.